Steve Wassell, Nexus Network Journal editorial board member and Sweet Briar College professor of mathematics has been named one of the country’s best undergraduate teachers according to The Princeton Review. Wassell is profiled in the Review’s new book, “The Best 300 Professors,” published April 3, 2012. Steve has participated at every Nexus conference since 1998, was Guest Editor of the NNJ vol 4, no. 1 (2002) issue devoted to the Golden Section, and co-editor of the vol. 10, no. 2 (2008) issue dedicated to Palladio. He has also co-authored books with Branko Mitrovic, Kim Williams and Lionel March. See his NNJ Editorial Board webpage at http://www.nexusjournal.com/eb-intro/eb-intro/stephen-r-wassell.html. Read more: Steve Wassell voted one of the 300 best! It is now possible to register online for the Nexus 2012 conference, 11-14 June 2012, in Milan. The fee for those who have been accepted as conference speakers is 160 Euros if registered before 31 March, and 200 Euros if registered after. All other participants who register before 31 March 2012 pay a reduced conference fee of 250 Euros instead of the full fee of 350 Euros to be paid for those who register between 1 April and 11 June. It is also possible to attend single days only at the conference by paying a daily fee of 100 per day on the day of participation. The registration process online is simple: from the conference website at http://www.nexusjournal.com/nexus2012-introduction.html click on "Register". This takes you to the website of the Politecnico di Milano. Simply provide information (name, address, e-mail) to create an account, then from the menu on the left side, select "Payment". Payment can be made with most major credit cards (Visa, MasterCard, American Express, etc.). We are looking forward to a fine conference in June! By presidential decree of November 29, 2011, the State Prize of Ukraine for Architecture for 2011 has been awarded to Radoslav Zuk, Emeritus Professor at the McGill University School of Architecture. As leader of the design team, Prof. Zuk was awarded the prize for the design of the Church of the Nativity of the Most Holy Theotokos in the city of Lviv. Radoslav Zuk participated in Nexus 2004 in Mexico City, presenting a paper entitled "From Renaissance Musical Proportions to Polytonality in Twentieth Century Architecture". He will be present once again at Nexus 2012 in Milan to discuss "Three Musical Interpretations of Le Corbusier's Modulor". Many, many congratulations to Architect Zuk. Nexus is proud to have such a contributor, as well as a good friend! Nexus Network Journal contributorDirk Huylebrouck has been officially named "Mad Professor" for his experiment with a footrace run clockwise. The 400m reverse experiment took place on Friday 16 September during the Diamond League athletic meeting in Brussels. Dirk described his interest in this way: "Actually, I became interested in this topic through architecture: why do some buildings twist to the right, others to the left? No architect ever reasoned about this, it is just done "out of the blue"... Calatrava for instance says he was inspired by the human torso for the torsion in his Malmö tower, but that only pushes the question further: why did he choose a human torso that turned to the right? Prof. Magli, of the Politecnico di Milano, and member of the scientific committee for Nexus 2012, which will take place in Milan 11-14 June 2012, discussed this in his paper in NNJ vol. 11, no. 1 (Spring 2009). You can read his article in the Nexus Network Journal at Springerlink.com. Congratulations to Prof. Magli for this fascinating report. Nexus authors have been busy! I'm very pleased to send news about five new publications by authors who are part of the Nexus community. Branko Mitrovic presented a paper at Nexus 2004 in Mexico City. 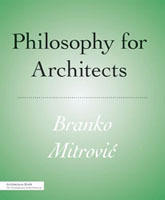 His new book, literally hot off the press, is Philosophy for Architects (Princeton Architectural Press, August 2011, ISBN 978-56898-994-5). The influence of philosophy on architecture has been manifest for centuries. Here, Mitrovic links philosophers from Plato to Derrida to architects from Palladio to Philip Johnson. More information on the Princeton Architectural Press website. Tessa Morrison presented a paper at Nexus 2008 in San Diego about Villalpanda's reconstruction of Solomon's Temple. 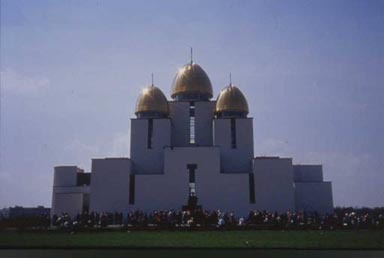 Her new book, Isaac Newton's Temple of Solomon and his Reconstruction of Sacred Architecture (Birkhauser, August 2011, ISBN 978-3-0348-0045-7) shows a surprising and unexpected facet of the great scientist. The book can be previewed on the Springer Link website: click here. Ivan Tafteberg Jakobsen has been an welcome participant at many Nexus conferences. His new book, ANTONI GAUDÍ. Geometrien bag arkitekturen (Matematiklærerforeningen, ISBN 978-8790996437, in Danish), is a beautifully illustrated textbook on geometry and architecture for secondary school students. More information is available here. Mathematicians Lionel March (Nexus 2002 in Obidos and Nexus 2010 in Porto) and Stephen R. Wassell (almost as many Nexus conferences as Kim!) teamed up with Kim Williams (director of the Nexus conferences and editor-in-chief of the Nexus Network Journal) to produce The Mathematical Works of Leon Battista Alberti (Birkhauser, ISBN 978-3-0346-0473-4). Includes translations and commentaries of Alberti's "Ex ludis rerum mathematicarum" (better known as "Ludi matematici"), "Elementi di pittura" (Elements of Painting), "De componendis cifris" (On Writing in Ciphers) and "De lunularum quadratura" (On Squaring the Lune). With a Foreword by Robert Tavernor (Nexus 2002, Obidos). The book can be previewed on Springer Link: click here. David Speiser, a very active participant in the first 4 Nexus conferences, beginning in 1996, combined his career as a quantum physicist with a lifelong interest in the history of art. This new volume, Crossroads: History of Science, History of Art (Birkhauser, ISBN 978-3-0348-0138-6). A first volume of his collected essays on the history of mechanics is followed by this second collection, edited by Kim Williams, on relationships between science and art. It includes his paper "Architecture, Mathematics and Theology in Raphael's Paintings" presented at Nexus 2000 in Ferrara. The book can be previewed on Springer Link: click here. Congratulations to these authors! We'll be looking forward to reading reviews of these books soon in the Nexus Network Journal ! The Second Edition of the International Workshop on Digital Fabrication and Parametric Design will take place from 24 to 31 July 2011 in the city of Vietri sul Mare, the gateway to the Amalfi Coast. The planning workshop, based on manufacturing processes of digital and parametric design software (Rhino / Grasshopper), will be held by the founders of Co-de-it Andrea Graziano and Alessio Erioli. The event is open to all those who want to learn the knowledge and how to perform the most innovative design methodologies existing The Workshop also enjoys the Digital Med University participation 'of Thessaly in Greece, Faculty of Architecture in Naples, the Order of Architects Province of Salerno and the National Builders. Interested parties may download the Notice of Competition at the address www.digitalmedworkshop.com and fill the pre-registration no later than July 15th 2011.